The girls enjoying the reason for the trip, wine! This past Saturday I went on my second of what I hope is many trips with "Authentic Canadian Tours". The day consisted of a visit to four wineries in beautiful Prince Edward County, time for a bit shopping in Bloomfield, and a stop at the famous Big Apple Bakery on the way back to the city. Our first winery stop was at Huff Estates. 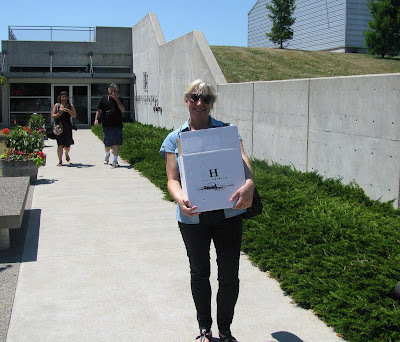 It didn't take us long to get into the wine tasting at this modern winery. We also enjoyed a delicious gourmet lunch on the patio with live music. We enjoyed a bottle of this 2009 Riesling with lunch, and a bottle came home with me. My delicious lunch of chilled grilled salmon with dill and new potatoes. Judy liked the wine at Huffs! Our next stop was to the pretty town of Bloomfield for a bit of shopping and an ice cream at Slickers. I picked up some pretty homemade soaps and enjoyed a homemade ice cream. Slickers make their ice cream daily and offer unique flavors, I enjoyed a lavender one. Lindsie enjoys her "Campfire Cream" which tasted like roasted marshmallows. Our next winery was Chadsey Cairns. This place just didn't offer great wine, it was full of character. The grounds hold old barns, big mature trees and a Pioneer Cemetery. This barn plays host to live music on weekends. Murray at the wine tasting station. Inside the wine tasting building. The girls enjoying the wine. I wonder how many wineries offer this unique feature. Our third winery of the day was also the largest we visited, Casa Dea Estates. We happened to visit on a Scottish Festival day and were treated to some dancing and bagpipe music, they were actually playing "Farewell to Nova Scotia" when we arrived. I didn't buy any wine here, but left with Scottish crackers and shortbread! The grounds here were lovely as well. Live entertainment on a beautiful day. The last winery of the day was also full of character, "The Grange" was simply gorgeous. I didn't purchase any wine here either, but left with a couple bottles of wine jelly that were simply delicious. The gang at the sampling bar. The inside of this building was beautiful. The wines of The Grange. On our way back to the city we stopped at The Big Apple bakery where we all indulged in some goodies. it was a wonderful way to spend a Saturday. Looks like a fabulous day! I love the bagpipes! We had so many plans for that day that I had to pass. Lemme know the next time you do something like that (or with this group) again. 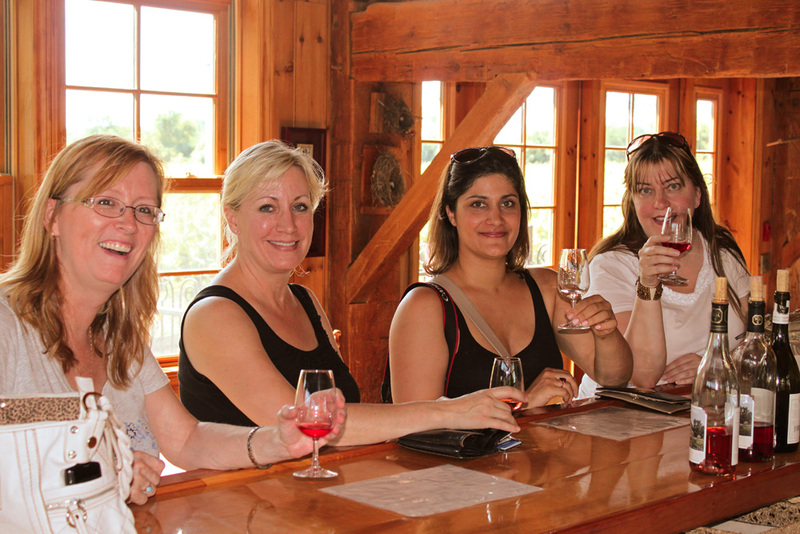 Looks like an amazing place for a wine tour!